Oak Island Fishing Charters went to the Gulfstream this morning looking for one of them 50lb Mahi’s. Everybody was at the edge of the break catching a few 10-20lbs but we were on a mission so we kept going offshore till we just got the filling it is not going to happen the way we hope. You know sometimes you just have to swing for the fence if you want a trophy but no worries we have been catching the grouper with no problem all months. Pulled up to a spot and it was over all most that fast 6 nice Scamp Grouper. I am trying something new tomorrow so standby. Oak Island Fishing Charters went grouper catching again today. To start off bait was easy then the first stop was producing nice Scamp Grouper till the crew got tired of fishing. Anyway we got the boats limits but had to take our time. Oak Island Fishing Charters was fishing for what ever want to bite our hooks today on 2- 1/2 day trip. Well the outcome was Sharks, Sharks and more Sharks nothing big today but it was something to keep the rod bent. Once again grouper you better get a good nights rest cause we are coming for ya in the morning. 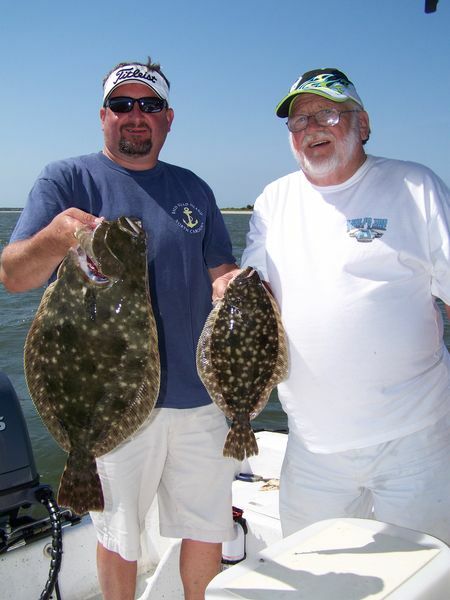 Oak Island Fishing Charters Big Flounder picture. One flounder is 18″ and the other is 28″ (7-8lbs) we also had several more around 18″ for the morning and a lot of fun fishing with these guys. Oak Island Fishing Charters picked up a group from Bald Head Island NC for a 1/2 day backwater fishing trip. After a slow start the flounder started coming in the boat so it looks like the flounder bite has kicked off so don’t wait to go fishing. BTW one of our fish was 28″ a BIG FISH and I will have pictures later. Make up trip is full, thanks. Oak Island Fishing Charters had a group that needed to cancel Monday May 3oth. 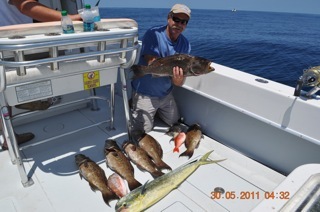 The way the weather looks it would be a great day to go catch a boat load of grouper like we have been doing. Give me a call or Email thanks. Oak Island Fishing Charters had a half day today and with the winds blowing hard we decided to run on the East Beach of Bald Head Island to look for calm water with fish. Oak Island Fishing Charters picked up a group from Bald Head Island this morning to go on a shark hunt. We started off trying to catch some fresh bait which was a task by its self. After we caught bait we started Shark fishing and in no time there was two put in the boat. With the morning being a success already we all decided to go home on a high note because we felt lucky to catch them so fast. Oak Island Fishing Charters went fishing for anything that would bite the hook for us today and the Sharks were everywhere.